The rover has been out of contact since a dust storm on the Red Planet. The rover landed on Mars in 2004. DURING 14 YEARS of intrepid exploration across Mars, it advanced human knowledge by confirming that water once flowed on the red planet — but NASA’s Opportunity rover has analysed its last soil sample. 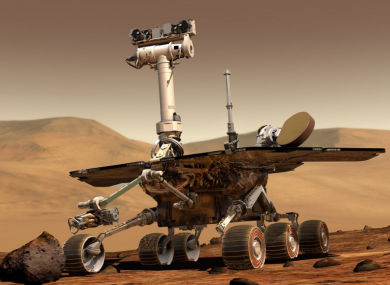 The robot has been missing since the US space agency lost contact during a dust storm in June last year and was declared officially dead yesterday, ending one of the most fruitful missions in the history of space exploration. The program has had an extraordinary record of success: 45.2 kilometers traversed, more than the Soviet Union’s Lunokhod 2 moon rover during the 1970s and more than the rover that US astronauts took to the moon on the Apollo 17 mission in 1972. Email “After roving on Mars for 15 years and sending back 217,594 images, Opportunity is now dead”. Feedback on “After roving on Mars for 15 years and sending back 217,594 images, Opportunity is now dead”.